This Saturday one of the oldest civic processions in the world will take place in the City of London. The Lord Mayor’s Show takes place on the 2nd Saturday in November every year, when the new Lord Mayor of London takes office, and makes a ceremonial journey from the City to Westminster. He or she swears their loyalty to the reigning monarch, and then makes their way back for a banquet at Mansion House. The procession starts at Guildhall, and consists of hundreds of floats, horses, people, bands and more, all celebrating hundreds of years of London history. 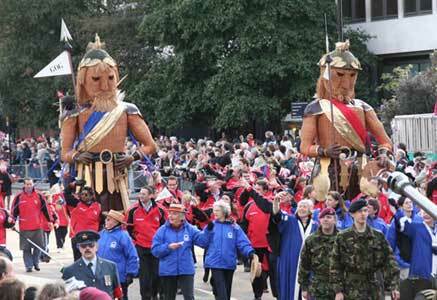 At the head of the parade are two wicker giants, representing Gog and Magog, supposed guardians of the City of London. Two smaller versions of Gog and Magog stand permanently on display inside the Guildhall itself (see above picture), but the below ones march to Westminster at the head of the parade. So how did Gog and Magog come to be the idols of our city? According to legends collated and no doubt embellished by Geoffrey of Monmouth in the 12th century, the mythical King Brutus, first King of Britain, set up his palace on the site where Guildhall now stands. Two giants named Gog and Magog used to live there before Brutus set up home, and upon arrival he defeated them, tamed them, and shackled them outside his palace, to become guardians of his estate. By the 15th century the story had sufficiently grown that Gog and Magog were considered guardians of the City of London, and took up their place in the annual Lord Mayor’s parade. And ever since Londoners have adopted them to their hearts as protectors of the City. Genesis 10:2, a reference to Magog in the table of nations. Ezekiel chapters 38 and 39, an end times prophecy describing God as being against Gog, chief prince of the land of Magog. How do we feel that figures closely associated with Satan, and who oppose Jesus at the final battle of Armageddon, have been adopted as the guardians of the City of London? What should our prayer response to this be? Let’s pray that Jesus is Lord over this city, and no one else. Mark Williamson also blogs regularly at One Rock International, a training organisation resourcing missionary leaders across the globe. He’s also passionate about praying for London, getting into deep conversations, and going for long walks with his wife Joanna.